How Far is GK Pride - Phase II? Ever felt the need for a home which is peaceful and quintessential. At GK Pride - Phase II it is no more a dream but a reality where you can live in your imagination. It has all that it takes to have a good residential space, a perfect location which makes sure that you have access to everything in the surrounding. Having a balanced life between the city and nature. The project has new apartments for sale in Hyderabad which are comprised of 2BHK with a size range of 1255 sq. ft. as well as decently styled 3BHK of a dimension 1685 - 2612 sq. 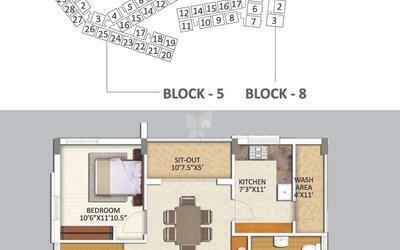 ft. and luxurious 4BHK with a size range of 2768 sq. ft. with magnificent ambiance for sale in Yapral, Hyderabad. Each home at GK Pride - Phase II brings alive the latest designs and trends. It is one of the best housing projects in the locale to fulfill your dreams. Situated away from the chaotic city life in Yapral, which is peaceful and pleasant. The project is set out in an expanse of 9.5 acreswhich incorporates all the facilities and amenities. This project location offers easy access to the nearby schools, hospitals, shopping malls, banks, market, and other civic utilities. You can buy a property in Hyderabad at GK Pride - Phase II and own the ritzy lifestyle, be a part of the tremendous project by GK Developers. Platfrom : Granite Platform with stainless steel sink, Provision for one RO Water Connection tap and one bore well connection tape. Plug point for refrigerator Television, Audio system etc. Drainage : ISI Mark standaard PVC / SWR Sanitary piping of prince / Sudhakar or Equivalent make. Sewerage Treatment Plant : Waste water treated by STP and reused for gardening.